It was February 21st, 2018. The possibility of a “teacher strike” loomed around the corner. Teachers were worried and anxious about whether or not the state would be able to unite as one in order to achieve the many changes needed that related to not only teachers, but also to many other state employees. Students were asking questions and social media was buzzing with news, excitement, and misinformation. I was just wrapping up my 8th year of teaching high school English in West Virginia. I had recently finished a lesson with my students about activism and using one’s voice to achieve a goal. We were mourning the tragic events of Parkland, FL and were sifting our way through emotions of anger, sadness, and confusion. Students wanted to know how they could make a difference. We created posters for the #ArmMeWith movement and students requested things such as: kindness, safer schools, and “resources and funding needed to help students experiencing depression” – rather than guns. They were enraged that the president suggested arming their teachers with guns. They didn’t realize that other major issues were going on in their state, unrelated to the tragedy that took place on February 14th at Marjory Stoneman Douglas High School. That’s when we started the discussion about why WV teachers were rallying to go on strike. After learning the abysmal statistic that WV teachers’ pay was ranked 48th in the nation, my students once again wanted to make their voices heard. They were interested in making #55Strong posters to show support for their teachers. Some of the posters created included messages like: more pay for teachers, give our teachers better pay and more respect, hard work deserves reward, and stand with teachers, they are raising the next generation. We prepared ourselves for what we knew was coming next: missed days of school. 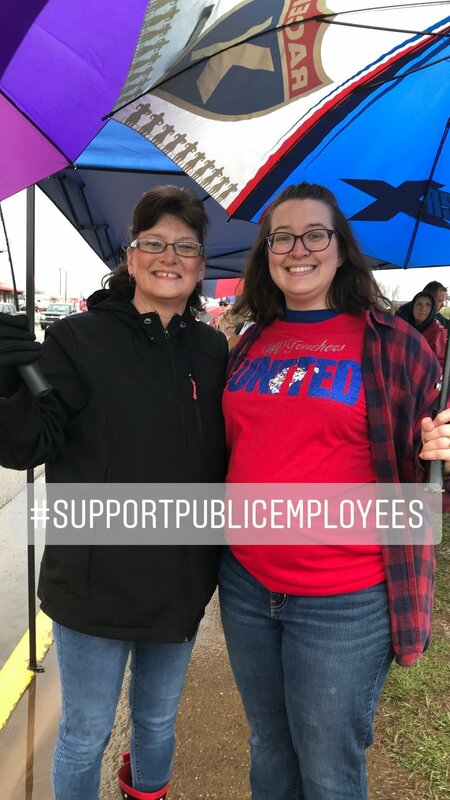 Communities were aware that school employees would probably not be coming to work the next day, and sure enough, when February 22nd rolled around, all 55 counties in WV had closed “due to an employee work stoppage.” From there, information about what was going on in Charleston and statewide was shared via word of mouth and news outlets. Communities were upset about having to find childcare for an undetermined amount of time and not everything said about the work stoppage was positive or true. Teachers in counties all over the state gathered to prepare food for students that might need a meal while school was not in session. Others gathered in front of school buildings holding posters that said things like, “Charleston: do your job so I can do mine” and “Walter White was an underpaid teacher with poor healthcare benefits and look how he turned out!” At first, the initial stoppage was supposed to last two days. Because deals in Charleston were not sufficient to satisfy state employees, the work stoppage continued. Overall, schools were closed for nine days before WV Legislature voted on a 5% pay increase. There were tens of thousands of protestors lining the streets of Charleston, WV daily with zero acts of violence, property damage, or arrests. I was so proud to be one of the teachers demonstrating to my students how to stand up for what’s right and how to peacefully use one’s voice to achieve goals. It was amazing to stand with my mother on the sidelines of my school, making history for WV.